6 November 2004, at 12:00a.m. By Casey W. Ritz, Ph.D. Extension Poultry Scientist, University of Georgia - This report looks at how Poultry production facilities must deal with the disposal of farm mortalities on a daily basis. Death loss in animal production is an unfortunate reality that requires appropriate handling to prevent the spread of disease, the potential for odor and pest problems, and the possible contamination of surface and ground water. This article focuses on the requirements in the state of Georgia, but is generally applicable to most producers. Mortality Management Options For Georgia Poultry Growers - By Casey W. Ritz, Ph.D. Extension Poultry Scientist, University of Georgia - This report looks at how Poultry production facilities must deal with the disposal of farm mortalities on a daily basis. Death loss in animal production is an unfortunate reality that requires appropriate handling to prevent the spread of disease, the potential for odor and pest problems, and the possible contamination of surface and ground water. A typical flock of 25,000 broilers averaging 3 percent total mortality will produce approximately 2,000 pounds of carcass during a 6 week growing period. This can represent a significant carcass disposal challenge over the life of the flock. A convenient, sanitary, rapid disposal system is critical for mortality management to be practical and effective and meet state and local regulations. Georgia law requires that a disposal system be approved by the Georgia Department of Agriculture (GDA) to prevent the spread of disease organisms from dead poultry to healthy flocks. Disposal of mortality is also regulated by the Environmental Protection Division of the Georgia Department of Natural Resources to protect air and water quality. The safe and appropriate management of poultry mortality begins with selecting the method best suited for your poultry operation. Each method has advantages and disadvantages. Adherence to proper management is the key to the successful use of any method. Regardless of the method used, Georgia law requires disposal of dead poultry within 24 hours of death or discovery. Environmental requirements, management procedures, costs and convenience of each system vary and need to be considered when determining which method is best suited for individual poultry operations. The traditional method of dead bird disposal in Georgia has been the use of burial pits. The pit is the simplest and most convenient method currently available to dispose of mortality. More than 90 percent of poultry growers in Georgia have pits as a primary or backup disposal method. If properly located away from a spring area or where ground water collects, mortalities will effectively decompose. However, concern over potential problems associated with pits has led to development of alternative disposal methods, including composting, incineration and other methods. Potential health and environmental risks can be associated with burial in the form of pathogen and nutrient pollution of groundwater. Pit residue can also linger for years. Although there have been no documented cases of soil or water contamination from poultry pits in Georgia, these potential risks may in the future cause additional restrictions or termination of burial as a mortality management method. Must be located at least 100 feet from any existing or proposed well, water supply line, or seasonal high water level of any surface water source. Must not be located within the 100-year flood plain. Maximum depth of 8 feet below the land surface. Maximum of 4 feet wide. Minimum of 1 foot above seasonal high groundwater elevation. Must not be located where the ground slope exceeds a moderate grade. Must be sealed to prevent the entry of rodents, insects and the exit of odors. The most common method of pit construction involves using a backhoe to dig a trench. A prefabricated concrete slab with one or two openings is placed over the trench, and the pit is ready for use. The cost for digging plus the slab is minimal, especially as the slab is reusable on a new pit once the old one is filled and covered with dirt. The life of the pit is variable, depending on soil conditions, number of birds loaded into it, and other management factors, but 1 to 4 years is common. Open pits are not acceptable under any condition. Pre-cast open-bottom septic tanks can be used to create a concrete disposal pit at relatively low cost. As the poultry industry in Georgia expands into areas where limestone or sandy soils are prevalent, problems may occur with the use of pits. In soils with little or no clay, and where high water tables are present, pit contents may potentially escape into surrounding soil and water. This concern has prompted other states to ban pits despite little or no scientific data regarding either the escape of pit contents or of soil type influences. None of the alternative methods can easily replace a properly located and constructed pit with regard to cost or ease of use. By properly locating and managing pits, Georgia may be able to maintain this as a viable mortality management option in the future. If losses exceed the capacity of the farm's daily disposal system, taking the birds to a landfill may be a practical alternative. The feasibility of using a landfill will depend on transportation costs, tipping fees and whether the landfill operation has been approved by the Georgia Environmental Protection Division to dispose of animal carcasses. Composting is the most widespread method used in states that have banned pits, and it is considered by many as the best alternative for mortality management. Composting is a natural process that generates a value-added end-product while keeping nutrients and biosecurity issues on the farm. Effective composting will require attentive management. Correct operation requires a covered area with a concrete or impervious floor to prevent rain or storm water from reaching the compost. Capacity of both the primary and secondary treatment areas should meet or exceed peak disposal requirements. Compost bins need a roof with an overhang to prevent rain from reaching the compost, as well as an impervious floor. An 8-12 inch layer of fresh litter or litter cake with 40-60 percent moisture will function as a starter supply of microorganisms responsible for composting. Carcasses should not be placed within 6 inches of the side walls or tops of bins. Daily mortality should be covered with at least 6-8 inches of litter/litter cake. When full, bins are capped off with an additional 6-8 inches of litter. Primary and secondary compost stacks should not exceed 5 feet in height to prevent compaction and loss of needed oxygen for microbial growth. Temperatures within the compost should be monitored regularly and must reach at least 130 degrees F in order to properly decompose carcasses and inactivate pathogens. A probe type thermometer can be used to measure the temperature profile of the compost to help determine the need for additional aeration. Compost is turned when the material in the first bin has undergone at least 7-10 days of composting after being capped off and the temperature has peaked (130-150 degrees F) and begun to fall. Pathogen control is accomplished when compost temperatures of at least 130 degrees F are reached through a minimum two heat cycles. Poultry mortality compost is not recommended for use on crops for human consumption. Incineration is one of the most biologically safe methods of mortality disposal. While easy to manage and sanitary, incinerators are slow and expensive to operate and can generate odor from gaseous and particulate emissions. During incineration, the entire carcass is reduced to ashes, which will not attract pests and can easily be dispersed. Incinerators must be permitted and meet all requirements of the U.S. Environmental Protection Agency and the Georgia EPD. Homemade incinerators are not acceptable and do not meet air pollution control standards. Future regulations on air quality may curtail widespread adoption of this technology. Rendering is a heating process that extracts recyclable ingredients such as protein and fat from animal tissue. Through this process, poultry mortalities can be converted into a valuable resource. Rendering is an approved method that may be useful to those who are located near a suitable rendering facility. Mortality that are taken to a rendering facility must be delivered within 24 hours of death unless carcasses are refrigerated or frozen and be transported within covered, leak-proof containers. Rendering is perhaps the most environmentally safe method of mortality management for poultry producers as it removes the mortality from the farm and relieves the grower of environmental concerns that exist with other methods of mortality management. Through rendering, mortality is recycled into a valuable, biologically safe protein by-product. There are, however, risks associated with this method, namely the potential spread of pathogens during the pickup and transport of dead poultry from one site to another. Adherence to strict sanitation and disinfection practices for transport vehicles and personnel can alleviate most biosecurity concerns. Purchase of a freezer for cold storage of carcasses is necessary unless they are delivered daily to a rendering plant. Cold storage containers must be pet and pest-proof. Other, less common methods include feeding fresh carcasses to alligators and fur animals, extrusion processing into animal feed, lactic acid fermentation, and digestion. These methods have strengths and weaknesses, depending on technology availability, cost, permitting and management considerations. Consult with your county extension agent if you wish to consider any of these options. Annual net cost can be used to compare mortality management methods. Researchers at Auburn University have compared the costs of mortality disposal. The accompanying table and figure compare the three predominant methods. Disposal pits had the lowest net cost per pound of carcass disposal at 3.68¢, followed by composting at 4.88¢ and incineration at 8.92¢. Net costs per pound of mortality decrease as the size of the operation increases. Although these comparisons were done using 1995 values, the relative position of these methods using current cost factors are the same. 1Values based on Auburn research, 1995. 2Values based on estimated increases in costs (CPI) 1995-2002. Table adapted from Crews, Donald and Blake. 1995. It is unlawful for any person to dispose of, or cause to be disposed of, dead poultry in any manner other by state-approved methods. At times mortality levels may exceed that which can be handled on a daily basis. Having a secondary method of mortality disposal can help to process heavier than normal mortality rates. In the event of significant mortality losses due to disease, natural disaster or other emergency situations, the Commissioner of Agriculture may approve the use of some other means of disposing of large quantities of dead birds. If a large volume of birds must be disposed of, burial is more economical than incineration. Composting has also proven to be an acceptable method for catastrophic mortality management. 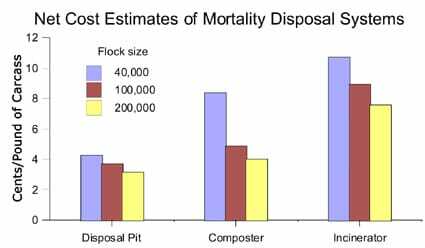 The principles of composting are the same with massive losses as with normal daily mortality. Siting of the compost windrow becomes a priority to prevent nutrient leaching and nuisance issues. Following prescribed compost management practices and ingredient loading recommendations will provide for effective catastrophic mortality composting. All poultry production operations are required to have written approval or certificate by the Georgia Department of Agriculture for the disposal of dead poultry. Restrictions and usage guidelines for each disposal method are covered within the regulations of the department. Approved methods and certificates of compliance are issued on a case by case basis as a grower selects the method and site location best suited for his particular operation. The letter requesting the permit should state the name that the producer wants to appear on the certificate of compliance and describe the disposal method of choice. It must also include any existing pit numbers where applicable. If the farm is new, this should be stated at the time of the request. There is no simple answer to mortality disposal challenges. Each poultry operation must select the most applicable method based on management ability, environmental conditions and financial constraints. In all cases, mortality management should be recognized as a potential health hazard and as a regulated activity in Georgia. Standards and best management practices for each method must be strictly maintained to ensure sanitary conditions and minimal environmental impact. Crews, J.R., J.O. Donald, and J.P. Blake. 1995. An Economic Evaluation of Dead-Bird Disposal Systems. Circular ANR-914, Alabama Cooperative Extension Service, Auburn University, Auburn, Ala.
Damron, B.L. 2002. Options for Dead Bird Disposal. Fact Sheet AN-126, Florida Cooperative Extension Service, University of Florida, Gainesville, Fla.
Donald, J.O., and J.P. Blake. July 1996. Update on Bird Disposal Methods. Poultry Digest. Poultry Water Quality Handbook. 1994. Poultry Water Quality Consortium, Chattanooga, Tenn.
Chapter 40-13-5 Dead Animal Disposal. Georgia Department of Agriculture Animal Industry Division.